Hello ! 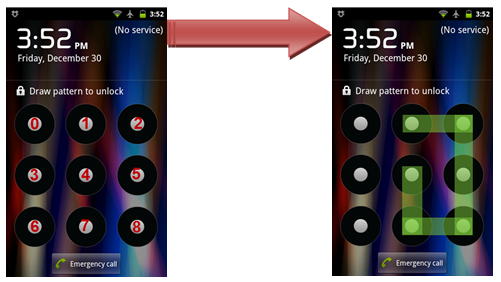 In this new post, I will explain how to retrieve current pattern of an Android device. For you information, this problem has been proposed on a web-based CTF (Capture the Flag) in a computer security competition. I always tried on a rooted device but if someone can try this trick on a non-rooted device, please send me back your results :-). I believe that the file where is stored the pattern is only readable by the system process. How does the pattern lock works ? So, if you use the pattern used in the right image above, the sequence will be : 1 – 2 – 5 – 8 – 7 – 4 or 4 – 7 – 8 – 5 – 2 – 1. Please note that the minimal pattern length is composed of 3 points and the maximal of 8. The only little problem facing us is that SHA-1 is a one-way cryptographic hash function (yes, it’s better for an hash…), meaning that we cannot get the plaintext from its hash. How to crack it ? We know that the pattern sequence is composed of sequence of number, between 0 and 8 and of length of between 3 and 8 digits. Based on this constatation, so we know that there is a finite number of possible hashs. We can imagine to generate a dictionary that contains all SHA-1 hash of sequence starting from 0123 to 876543210. This dictionary can be downloader here. Once downloaded, just use this python script to get the pattern corresponding to the hash. print "Supply a valid gesture key file or raw text hash"
print "Database archive doesn't exist, put rainbow.db.gz in current working directory"
print "Nothing was given to the database to check. Check gesture input file." print "Cannot find db file." print "No match, check input." Just wait some seconds, and the sequence of point is displayed. Tagged android, attack, hacking, vulnerability.